Gopher Purge or Mole Plant contains a latex like milky sap that is found in the roots, leaves and flowers. Poinsettias are members of the same genus and contain the same kind of sticky sap which can cause skin irritation in sensitive people. This caustic substance is not a repellant but a contact irritant. The varmint must chew the roots to become ill or die. In order to protect plants from gophers or moles, a thick stand of Euphorbia planted in the gopher's main tunnel is necessary. 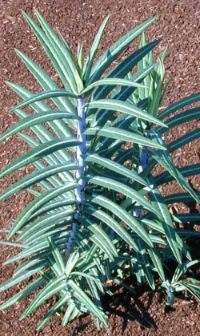 And, because it dies every two years, it is necessary to be vigilant and replant or your precious protected plant becomes exposed. 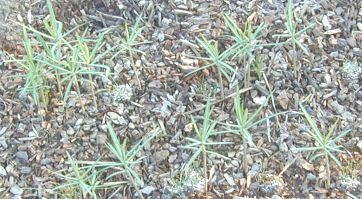 Fortunately, Gopher Purge (sometimes called Gopher Spurge) reseeds readily. Sprouting in the early spring, small plants can be easily transplanted from the ground to the desired location. Or, you can leave it alone and let it naturalize itself. These unusual flower buds of Gopher Purge will eventually open and set seeds. If you do want seedlings, you may leave the pods to fall or collect them when they have turned brown.